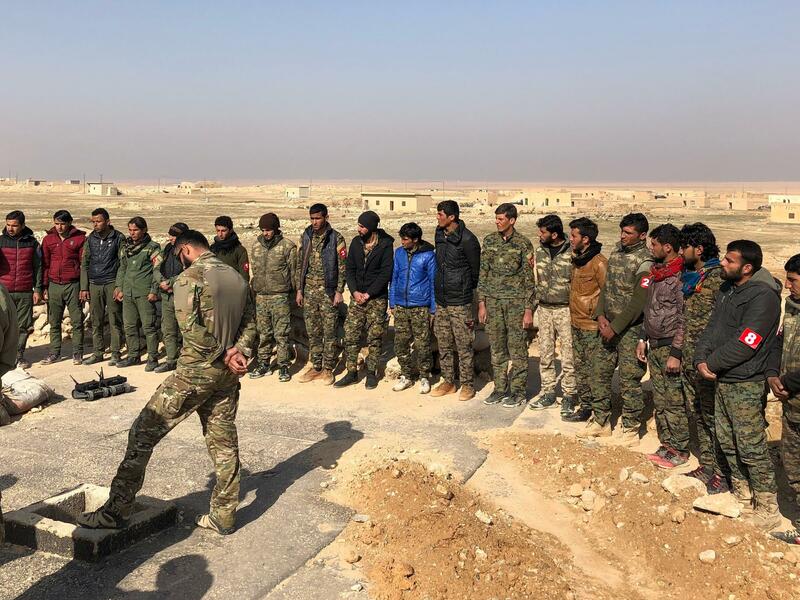 Young men outside Raqqa, Syria, training to find and destroy hidden explosive devices left by retreating ISIS forces. 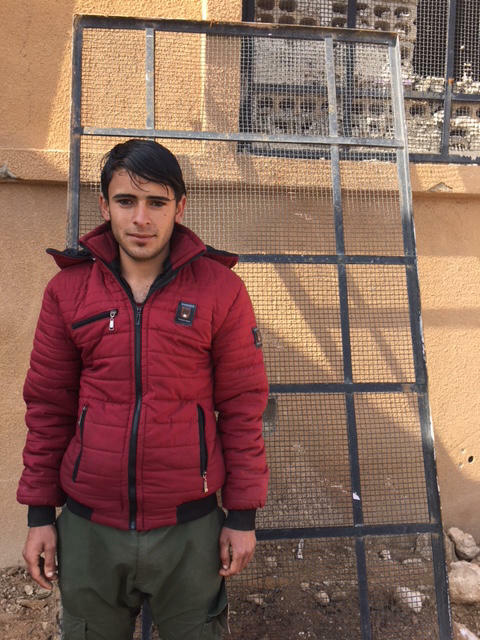 Nabeel Mukhil Hamza is training to learn how to disable explosive booby traps left by ISIS throughout Raqqa. In an exercise a Syrian instructor and his young student are trying to do just that. A mock explosive is set inside the metal front door of an abandoned house. They slide a selfie stick with a camera inside the gap in the door, searching for the wire to cut. Suddenly there's a sharp beeping sound. That's not the sound they wanted to hear, says the American special forces trainer. "We have penalty alarms that you step on and it signifies an explosion," he explains. That mock explosion would likely have killed or maimed both men, much like the real explosions that happen daily in Raqqa just down the highway. Some three dozen casualties each week from the thousands of booby trapped doors, chairs, even cooking pots. And the method is cruelly simple. The bombs are detonated by what looks like a beaded necklace made of fishing line, with small metal discs set inside plastic capsules. When crushed by a foot, the discs come together and complete a circuit, setting off the explosion, says the trainer, who cannot be named for security reasons. "They blend into just about anything," he says. "Tile. Rock. Very hard to see and very simple to make and very hard to detect, not a big metal signature." Still, a metal signature that could be picked up by sophisticated equipment. But the American and Syrian trainers want their students to use their minds and their eyes first. Scan the ground for something that looks out of place. "They make a lot of mistakes," the American says, "but we want them to make them here." Nearby some other students are practicing detonating a mock explosive. They place a plastic hook on a wire and then walk backwards, unspooling what looks like kite string. That way they move to a safe distance, and either cut the wire or pull it to detonate the bomb. Raqqa is laced with such bombs, says Christina, a surgeon with the U.S. special operations forces here, who sees the toll every day. "It's people that are trying to go back into their homes whether they're collecting belongings or trying to move back in to see what's left," the surgeon says, "and it's just devastating." Devastating wounds on mostly men, she says, but some women and children, too. "A lot of lower-extremity wounds, but we see a lot of penetrating head trauma, a lot of chest stuff, abdominal stuff, a lot of traumatic amputations of limbs." Not one of the graduates trained here has been a casualty on the job. But most have lost family members to ISIS booby traps, bullets or executions. One of the students here is Nabeel Mukhil Hamza. He's a slight 19-year-old, wearing a red parka. He's from Raqqa, where he was once jailed by ISIS for four days. His crime? Smoking. "We attend this course of training to protect the civilians and to clear the city of any IEDs and explosives," he says. Most of the young men have lost family members to booby traps, bullets or executions at the hands of ISIS. Hamza says his brother-in-law was killed when he stepped on a landmine. He was just 36 and left behind a wife and young daughter. Hamza says some of his neighbors' homes are laced with booby traps, one just 40 feet from his house, where he lives with his mother. "I'm not scared, I'm here for my ultimate goal — safe homes," he says, though he acknowledges his mother is nervous. "She just prays for me and says, 'May Allah save you.'" About a 150 young men like Hamza have been trained. But officials here say the threat is so great, hundreds more will be needed. NPR producer Greg Dixon contributed to this report. When fighters for ISIS abandoned their capital, they left behind a deadly parting gift. Islamic State fighters salted that city, Raqqa, with explosive booby traps. Now, young Syrian men are training to remove them. NPR's Tom Bowman traveled to Raqqa to see the preparations for perilous work. TOM BOWMAN, BYLINE: The Syrian instructor and his young student are trying to dismantle a booby trap that's set inside the metal front door of this abandoned house in a village on the outskirts of Raqqa. They slide a selfie stick with a camera inside the gap, searching for the wire to cut. BOWMAN: That's not the sound they wanted to hear, says the American Special Forces trainer. UNIDENTIFIED MAN: We have penalty alarms that you step on, and it signifies an explosion. BOWMAN: That mock explosion would likely have killed or maimed both men, much like the real explosions that happen daily in Raqqa just down the highway. There are some three dozen casualties each week in Raqqa from the thousands of booby trap doors, chairs, even cooking pots. And the method is cruelly simple. The bombs are detonated by what looks like a beaded necklace made of fishing line with small metal disks set inside plastic capsules. When they're crushed by a foot, it completes a circuit, setting off the explosion, says the trainer who cannot be named for security reasons. UNIDENTIFIED MAN: They blend into just about anything - tile, rock. They're very hard to see and very simple to make and very hard to detect - not a big metal signature. BOWMAN: A metal signature that could be picked up by sophisticated equipment. These students will get some of that high-tech equipment, but the American and Syrian trainers want them to use their minds and their eyes first. Scan the ground for something that looks out of place. UNIDENTIFIED MAN: They make a lot of mistakes, but we want them to make them here. BOWMAN: Nearby, some other students are practicing detonating an explosive. They place a plastic hook on a wire and then walk backwards, unspooling what looks like kite string. That way they move to a safe distance and either cut the wire or pull it to detonate the bomb. BOWMAN: And Raqqa is riddled with these bombs, says Christina, a surgeon with the U.S. Special Operations Forces here who sees the toll every day. CHRISTINA: It's people that are trying to go back into their homes whether they're collecting belongings or trying to move back in to kind of see what's left. And their houses are booby trapped and they're, you know, just devastating. BOWMAN: Devastating wounds on mostly men, she says, but some women and children, too. CHRISTINA: A lot of lower extremity wounds, but we see a lot of penetrating head trauma, a lot of chest stuff, abdominal stuff, a lot of traumatic amputations of limbs. BOWMAN: Not one of the graduates trained here has been a casualty on the job, but most have lost family members to ISIS booby traps, bullets or executions. One of the students here is Nabeel Mukhil Hamza. He's a slight 19-year-old wearing a red parka. He's from Raqqa, where he was once jailed by ISIS for four days. His crime - smoking. Why are you here doing this training? NABEEL MUKHIL HAMZA: (Through interpreter) We attend this course of training to protect the civilians, also to clear our city out of the IEDs or any type of explosives. BOWMAN: Have you lost any friends or family members? HAMZA: (Through interpreter) During the day that Raqqa was under the control of ISIS, my brother-in-law, he tried to run away with his family. Unfortunately, he stepped on one of those mines and lost his life. BOWMAN: He was just 36 and left behind a wife and young daughter. Hamza says some of his neighbors' homes are laced with booby traps - one just 40 feet from his house where he lives with his mother. Is he afraid about his new career? HAMZA: (Through interpreter) No, I'm not scared. I'm here for my ultimate goal, which is to make everyone safe in my city. I want all those displaced people to come back. They are safe homes. BOWMAN: When you told your mother you wanted to do this, what did she say? HAMZA: (Through interpreter) She just prayed for me. She said, may Allah save you. BOWMAN: About 150 young men like Hamza have been trained so far. But officials here say the threat is so great hundreds more will be needed. Tom Bowman, NPR News, near Raqqa, Syria. (SOUNDBITE OF DHAFER YOUSSEF'S "ASCETIC JOURNEY") Transcript provided by NPR, Copyright NPR.